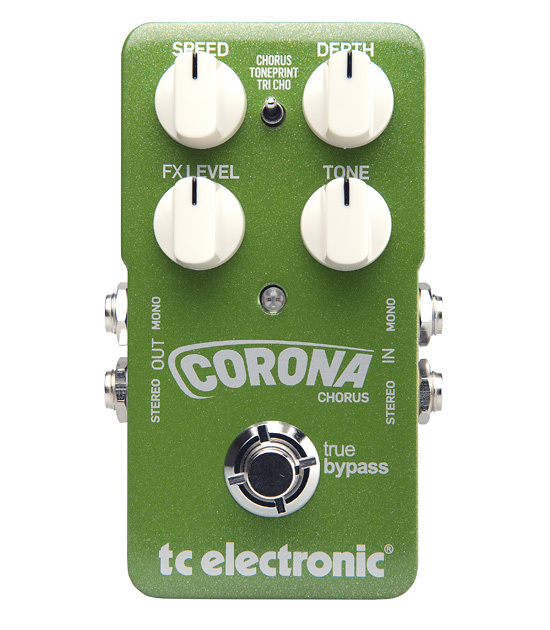 TC Electronic comes out with the Corona Chorus (announced at Winter NAMM 2011). From what I’ve been reading and watching about this chorus pedal, it’s a winner! Very tweakable, with three different modes including their classic SCF chorus, Tri-Chorus, and TonePrint, which allows you to download settings directly into the pedal via a USB connection to your computer. I have never owned a TC Electronic device; though I’ve tested a few of the Nova line pedals, and they sound great, one thing that has turned me off in the past is the size of the pedals I tested. Now with TC Electronic’s new compact pedal line, all that tonal goodness TC Electronic is known for can be had in a more standard form factor! I don’t have a lot of chorus pedals; in fact, I only have two (BOSS CE-2 and a Homebrew THC), and I love them both. I use the THC for acoustic guitar, and use the CE-2 for electric. But I was just thinking that I’d like to have a more tweakable chorus to accompany my CE-2, as it’s kind of on the bright side, and sometimes I want something much darker, plus the versatility of the Corona would be awesome to accompany the CE-2 on my board. And no, I wouldn’t remove the CE-2 because it has a very distinctive tone that I have not been able to duplicate with any other pedal – ever. From the techie side of things, the Corona is true bypass, and as TC Electronic puts it, Analog-Dry-Through, which simply means that the dry signal through the pedal stays dry and the effect is blended in. Very nice. That would definitely make it easy to put in front of an amp. and avoid; guitar forums, guitar magazines, guitar stores, guitar buddies, etc. My only compaint about TC was the price. I do not care how big the box is I just want the tone. TC has tone. I tried a really condensed space pedal board and I had so much trouble hitting switches without bumping knobs on other pedals. I changed to long board w my pedals more in a chain line, makes life so much easier and you can even have a beer or two and still work your board. I only wish TC would make more varities like overdrives and dist units may maybe that is not their thing, but how about a TC VIBE now that would be seriously cool! The new Compact line is actually pretty reasonable. And BTW, they added both a distortion and overdrive pedal. I don’t mean to rain on anybody’s parade, but in my opinion, a chorus pedal just might be the least valuable of all pedals to own. Every one I’ve ever played gives this overly pinched, semi-constipated tone that sounds less like a guitar and more like a muzak outlet. If you like ’em, more power to you. Count me out! Chorus is definitely one of those pedals that you either love or hate. Absolutely! I love my Corona. With the TonePrints, you can get a lot of chorus sounds out of it, though I tend to use it as a smooth chorus when I’m playing electric guitar. For acoustic, I use my BOSS CE-2. Problematyka zbliżona każdemu, rekomenduję publikację Brinkmann.